Natural history in the eighteenth century was many things to many people—diversion, obsession, medically or economically useful knowledge, spectacle, evidence for God’s providence and wisdom, or even the foundation of all natural knowledge. Because natural history was pursued by such a variety of people around the globe, with practitioners sharing neither methods nor training, it has been characterized as a science of straightforward description, devoted to amassing observations as the raw material for classification and thus fundamentally distinct from experimental physical science. In Catching Nature in the Act, Mary Terrall revises this picture, revealing how eighteenth-century natural historians incorporated various experimental techniques and strategies into their practice. At the center of Terrall’s study is René-Antoine Ferchault de Réaumur (1683–1757)—the definitive authority on natural history in the middle decades of the eighteenth century—and his many correspondents, assistants, and collaborators. 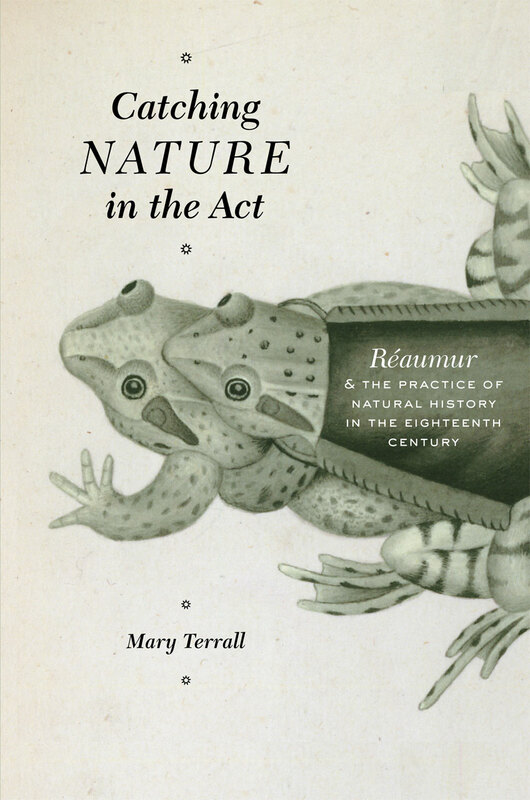 Through a close examination of Réaumur’s publications, papers, and letters, Terrall reconstructs the working relationships among these naturalists and shows how observing, collecting, and experimenting fit into their daily lives. Essential reading for historians of science and early modern Europe, Catching Nature in the Act defines and excavates a dynamic field of francophone natural history that has been inadequately mined and understood to date. 2. "Catching Nature in the Act"
4. Recruiting Observers and Training "Philosophical Eyes"
Eminently readable. . . . Mary Terrall strikes a fine balance between description and explanation, enriching compelling analyses with fascinating anecdotes. "A meticulously researched and beautifully written account of the observational and experimental practice of natural history during the first half of the eighteenth century in France. . . . just as Réaumur gave his readers the means to see nature differently, Terrall transforms our picture of natural history with this superb and thoroughly absorbing book." "Should be considered essential reading for historians of science, but Terrall’s narrative style and storytelling ability will make it appeal to a much broader audience." "A lively narrative, where members of what we call today the 'scientific network' of naturalists have the spotlight, and where a large place is reserved for the story of the--at times highly amusing--experiments conducted by the learned jack of all trades and his followers." "Terrall does an excellent job in articulating and demonstrating different ways of doing natural history in the early to mid- eighteenth century. She also captures the thrill of doing natural history, of catching nature in the act."